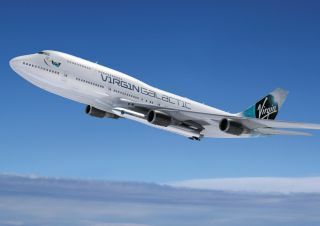 Virgin Galactic will launch small satellites into space from "Cosmic Girl" (seen here in an illustration), a 747 jumbo jet that will serve as an aerial launchpad for the LauncherOne rocket. Virgin Galactic will launch small satellites to space beneath the belly of a Boeing 747 jet nicknamed "Cosmic Girl," company representatives have announced. Cosmic Girl is no stranger to the Virgin family, coming to Virgin Galactic from its sister company Virgin Atlantic. The jet will now be modified to accommodate a satellite-launching rocket called LauncherOne, beneath the plane's left wing. Virgin Galactic unveiled Cosmic Girl in a recent video last week that shows just how it will loft LauncherOne rockets into space. An artist's illustration of Virgin Galactic's new 747 jumbo jet "Cosmic Girl" launching a LauncherOne rocket from high altitude. Virgin Galactic unveiled the rocket-toting carrier plane on Dec. 3, 2015. "I never imagined that today one of our 747s would get a second chance and help open access to space," Branson added. "I'm absolutely thrilled that Cosmic Girl can stay in the Virgin family — and truly live up to her name!" Virgin Galactic founder Sir Richard Branson and pilot Kelly Latimer pose for a photo during the Dec. 3 unveiling of the company's Cosmic Girl jet, a carrier plane for its LauncherOne rocket. During a mission, Cosmic Girl will fly up to an altitude of about 35,000 feet (10,670 meters). At that point, the two-stage LauncherOne rocket will blast off from its airborne platform, carrying into space payloads that weigh 880 lbs. (400 kilograms) or more. Both stages of LauncherOne will then fall back to Earth, while Cosmic Girl will fly back to a predetermined airport. "Air launch enables us to provide rapid, responsive service to our satellite customers on a schedule set by their business and operational needs, rather than the constraints of national launch ranges," Virgin Galactic CEO George Whitesides said in the same statement. "Selecting the 747 airframe provides a dedicated platform that gives us the capacity to substantially increase our payload to orbit without increasing our prices." Virgin Galactic will charge less than $10 million to take satellites to sun-synchronous orbit via LauncherOne, company representatives have said. This won't be the first time a 747 aircraft has played a role in spaceflight. Over the years, 747s have supported a variety of special missions, including the space shuttle Enterprise test-flight program, NASA's Shuttle Carrier Aircraft program, the Pratt & Whitney flying test bed, and flight tests of the X-45 "Phantom Ray," Virgin Galactic representatives said. Another commercial spaceflight company, Orbital ATK, also launches small satellites from an airborne jet. Orbital ATK's Pegasus rockets launch from a modifed L-1011 jet dubbed "Stargazer." Virgin Galactic's Cosmic Girl aircraft has already gone through initial inspections and tests, and it will undergo further maintenance checks and repairs prior to the start of wing modification. If all goes according to plan, Cosmic Girl and LauncherOne could begin lofting satellites by the end of 2017. Virgin Galactic's SpaceShipTwo, a six-passenger vehicle being developed for suborbital space tourism and research, is also air-launched, from the belly of an aircraft called WhiteKnightTwo.